Some of the friends on my list have yellow names now. I can't seem to find out if it has to do with their status or something new added in the options, but I can't recall having seen this earlier this year. What do these yellow names represent, and how do I get them? One of the Lunar New Year rewards introduced in this year's Lunar New Year Steam sale lets you turn your Steam profile golden for a limited time. Users with golden profiles also have their name displayed in gold, and a gold border around their profile avatar. Are classic games released on Steam somehow optimized for modern computers? Can I “follow” games on Steam without getting desktop notifications? 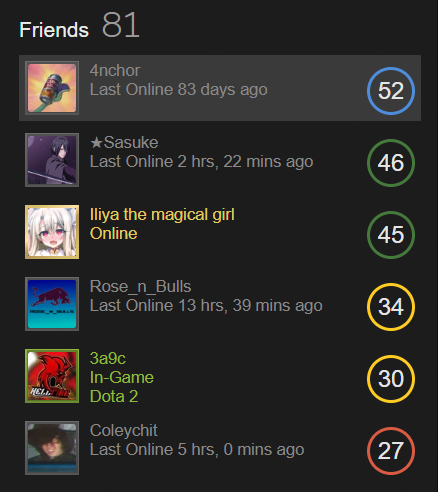 When exactly does Steam mark someone as 'Online'?